Following a tumultuous primary season and a nerve-wracking election night, Californians elected two candidates who will run for governor this coming November: Democrat Gavin Newsom – a former San Francisco mayor who became increasingly popular among the state’s liberal voter-base, and Republican John Cox – a real estate mogul who promotes far-right sentiments, and who has recently won the endorsement of President Trump. Although Newsom’s victory is predicted to be secured in November, as Democrats enjoy a supermajority in California’s political sphere, the recent race, as well as the outcome of the election, indicates that the state’s Blue facade may be gradually cracking, giving way to persistent currents of Red. In order to understand the significance of last night’s results, one must consider California’s top-two primary system. 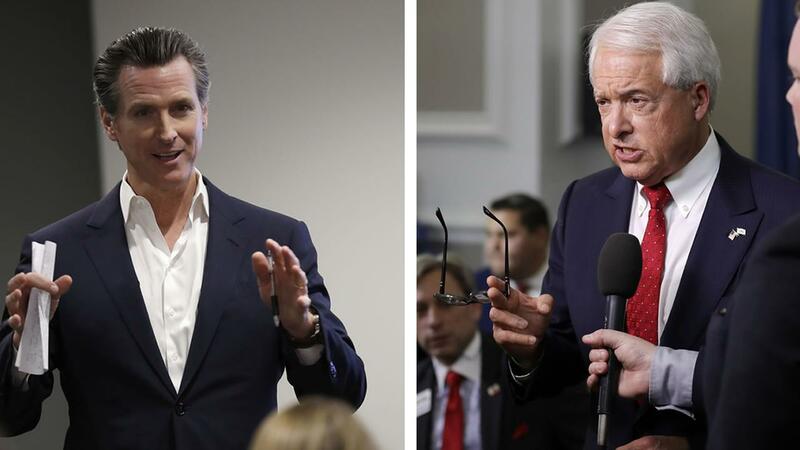 Unlike in other states, in which the two final candidates for the gubernatorial race include one Democrat and one Republican, California’s laws stipulate that the top two contestants are those who garnered the most votes, regardless of party affiliation. Thus, as many expected the majority blue state to advance two Democrats to the November ballot, Cox’s victory over former LA mayor and establishment Democrat Antonio Villaraigosa, came as a shock and a reminder that in the Trump era all bets are off. Even if Cox loses in November, as is expected, the mere fact that he clawed his way up to the top two race seems to energise Republican voters, who are now more eager than ever to maintain (and possibly expand) their grip on South California congressional districts. At the same time, Cox’s victory gives a nod to religious fundamentalists, particularly evangelists, who set their sights on the state’s political institutions in order to thwart Democrats’ liberal agenda. What are the consequences of such developments? In the state of California, this could mean that Cox’s far-right sentiments would infiltrate anything from school boards to city municipalities to local government branches. It could mean that his objection to the increased tax on gas would gain momentum, and hinder the state’s conservation policies. It could mean that his agenda to decrease state funding of healthcare and welfare services would be more heavily campaigned in Republican majority districts. It could also mean that his promise to terminate the existence of sanctuary cities for undocumented immigrants in California would resonate more deeply with Republican voters across the state, and potentially be translated into action by those in power. On a national level, Cox’s achievement could reassure the force and impact of Trump’s endorsement, and inspire like-minded far-right extremists to invest more in blue-state campaigns. Although California remains a bastion of liberalism, the hyper-conservative pockets within it should not be ignored. Therefore, it is crucial that those concerned with issues of civil and human rights and the conservation of our planet show up to cast their vote in November, while fighting in their local communities to block the tidal influence of extremists in the state’s social and political spheres.